It is an optical microscopy illumination technique that convertsphase shifts in light passing through a transparent specimen to brightness changes in the image. The phase shifts themselves are invisible to the human eye, but become visible when they are shown as brightness changes. Phase contrast microscopy is particularly important in biology, as it reveals many biological structures that are not visible with a simpler bright field microscope. These structures were often made visible to earlier microscopists by staining the slide. This requires additional preparation and it also kills the cell. 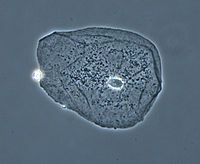 Phase contrast microscopy of live cells without staining allowed for the in vivo study of the cell cycle. When light travels through a medium other than vacuum, interaction with this medium causes itsamplitude and phase to change in a manner dependent on properties of the medium. Changes in amplitude arise from absorption of light, which is often wavelength dependent and may give rise to colours. The human eye measures only the energy of light arriving on the retina, so changes in phase are not easily observed under optimal bright field illumination, yet often these changes in phase carry much important information. The same situation applies in a typical microscope with "Köhler" bright field illumination, i.e., although the phase variations introduced by the sample are preserved by the instrument (at least within the instrumental limits of imaging perfection) this information is lost in the process of image recording, which measures only light intensity. In order to make phase variations observable, it is necessary to combine the light passing through the sample with a reference so that the resulting interference reveals the phase structure of the sample. This problem was first appreciated by Frits Zernike during his study of diffraction gratings. During the course of his work he realised that it is necessary both to achieve interference with a reference beam, and (for maximizing the contrast achieved with the technique) to introduce a phase shift to this reference beam so that the no-phase-change condition gives rise to completely destructive interference. He later realized that the same technique can be applied to optical microscopy. The necessary phase shift is introduced by rings etched accurately onto glass plates so that they introduce the required phase shift when inserted into the optical path of the microscope. When in use, this technique allows the phase of the light passing through the object under study to be inferred from the intensity of the image produced by the microscope. This methodology is known as the phase-contrast technique. In optical microscopy many biological objects such as cell components in protozoans, bacteria and sperm tails are fully transparent unless stained. (Staining is a difficult and time-consuming procedure which can destroy or alter the specimen structure). The difference in densities and composition within the imaged objects however often give rise to changes in the phase of light passing through them, hence they are sometimes called "phase objects". Using the phase-contrast technique makes these structures visible and allows their study in living specimens. This phase contrast technique proved to be such an advancement in microscopy that Zernike was awarded the Nobel prize (physics) in 1953.